BRISTOW, VA -- I don't consider Bristow Manor any further out in the country than some of the other upscale public golf courses in the Washington DC metro area. But it sure feels that way. The country theme has its appeal though--and one of the nice parts about Bristow is that it's really not that far out--about a half-hour from the Washington Beltway, just west of Manassas. 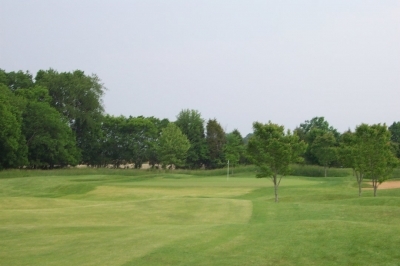 Gene Garotte, the General Manager of Bristow Manor, says the appeal of the course is its unique links style play in addition to its location: "It's the only real links style course in the area, and people are attracted by that. It's nice to look at, but also fairly wide open and playable." And although it looks like the course was placed in the middle of the grain belt, it isn't far removed from civilization. We might have heard cows mooing at Raspberry Falls, but there aren't any livestock visible or within earshot of Bristow's fairways. It's a Ken Killian designed course with a rural feel and city convenience. Put together, it makes for a very good package. Adding to the country allure is the late 19th century Manor House that is the most visible landmark on the relatively flat ground that makes up the area (unusual for Northern Virginia). The House adds a southern plantation flavor to the grounds and allows one to harkin back to the days (not too long ago in a lot of ways) when this was a peaceful farming community in rural Virginia. The House now serves as a multi-purpose meeting facility, and the property hosts quite a few weddings, banquets and business meetings. Aside from being part of the historic countryside, Bristow Manor is known for a couple things that make it a great golf experience. First and most noteworthy is its links design. Several Northern Virginia tracks bill themselves as links style, but Bristow's back nine is probably the closest to a true seaside links course in the region. Bristow doesn't have stacked sod bunkers or stone walls, but it does have undulating fairways, mounds and holes bordered by tall grass. The visual presentation is part of the package--and it all works very well. Like Scottish links courses, it's fairly wide open and has very few areas that would be considered 'out of bounds.' If you can find it, you can play it--even if it's in the middle of another hole's fairway. It also has more water than a links course would. Ponds come into play on a number of holes, and there's a stream that you must cross on several links on the front nine. Because the property is so wide open, wind adds to the challenge. All you'd need is a stiff breeze, some salt in the air and some intermittent rain squalls and you're right back in the old country. I was half expecting a kilt wearing, bagpipe playing Scotsman to appear around the corner at any moment. Gentle undulations and subtle mounding define Bristow Manor, along with tall grassy areas reminiscent of Scotland. Bristow's also known for excellent conditioning. Featuring Zoysia fairways along with bentgrass tees and greens, it's difficult to find a poor lie anywhere in the maintained areas. And that's saying a lot, considering we played the course in early November! All this being said, the course is pretty difficult, too. Although the fairways are generous, the track plays to 7102 yards from the back and a par of 72 (recently resloped at 133)--it'll test your driver as well as your shotmaking abilities. Greens are small to medium sized and quick! They won't get you with massive undulation, but subtle breaks and wind direction must be taken into account when using the short stick. There are three other sets of tees to match your skill levels, but this is one course where I'd recommend playing perhaps a level or two above what you normally play. Playing the regular tees (white) takes the driver out of your hands too often and takes away some of the difficulty that you should face on the par fives--and also a couple of the par fours. That may be good for your scorecard, but you're not getting from the course what you could if you perhaps moved it back a notch. I'm not claiming that playing the regular tees makes it too easy--but it takes away some of the challenge. For example, the two par fives on the front both face west and have a stream that crosses the fairway about a three-wood's shot from the tee. To drive safely, you probably should take a long iron, and there's no realistic chance of reaching the putting surface in two. These holes aren't really risk rewards because the risk doesn't reward you, unless you can hit a ball 280 yards in the air. Moving your tees back to either the gold or back (black) tees adds some elements of difficulty that enhance the course, in addition to making it play more challenging. Adding to an already thought provoking front nine is the club's signature hole, number seven. 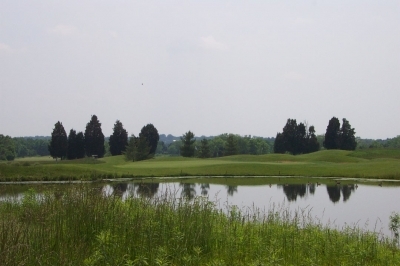 467 yards from the back, it plays to a dogleg right, with the right side protected by a pond and the left side and long guarded by dense bushes and trees. A driver well struck will probably go through the fairway--unless you're trying to cut off the leg--and there isn't much fairway room to do that. The second shot is over a creek to an elevated putting surface well protected by bunkers. A very difficult hole--if your drive isn't in a good spot, it'll require a layup short of the creek and bring a tricky third into the green. Garotte says that they'll probably cut down the rough before the green next year to make the hole play a little easier--to allow for some runup shots. Thank God! The back nine plays about 140 yards shorter and somewhat easier, since there isn't the stream to contend with (which impacts five holes on the front) and water only comes into play on three or four holes. It's more of a links feel than the front, as most holes are trimmed by tall grass and you can easily play your drive from the adjoining fairway if you stray too far. Particular favorites on the back were 15 and 18. Fifteen is a 395 yard par four from the tips. Views from the tee are framed by a bunker left and wetlands to the distant right. The fairway has mounds that remind you of a Scottish pasture--a true link! Part of the beauty of the hole is that there isn't a clear target to shoot at--but the fairway is wide. The approach shot will call for a short iron into a well bunkered green. Good hole. Eighteen is an interesting finishing hole. 429 yards from the back, you don't want to use a driver off the tee. Even a three wood may be too much, as a bunker waits for a drive struck too long, and a marshy pond is to the left. Smart play is to layup with a long iron or a five wood--but that'll leave another long iron into a green that's perched right on a pond front and left. There is room to bail out right, but that will leave a tough up and down. The final hole certainly tests what nerves you have left after the first seventeen links. There's little to hinder the wind at Bristow -- better be able to keep the ball low. Bristow Manor provides a great golfing trip. It combines a peaceful day in the country with some fair golf challenge and a glimpse of links golf across the great pond. Just the way the game was meant to be! 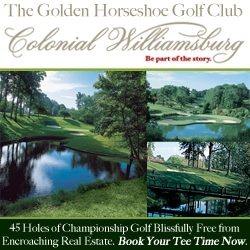 Note: See links below for other reviews of courses in Northern Virginia. Twilight Rates and Seasonal Rates are also available. Call the Pro Shop for more info.